Please use this link to add, remove, or change your address. Bring in your plastic pots to be eligible for a drawing! Gardeners love to learn from other gardeners "over the fence." We would love to include a tour and/or an article from one of our readers! "Spring is when you feel like whistling even when your shoe is full of slush." GREETINGS: The long winter's nap is over! With the arrival of this month, it is literally time to begin the process of preparing your soil so you can enjoy a successful gardening season. Last year, we became a distributor of Full Circle Compost products. If you are not familiar with their product line-up, you won't believe what you have been missing out on. At this time of year, it is time to prep your garden soil. We are recommending Full Circle Kick, an all natural, enviro-friendly blend of choice organic matter and nutrient rich Full Circle Boost (which contains worm compost, sea kelp, fish protein and amino acids). For those of you who want to start seeds, they offer a potting soil called Full Circle Soar. In addition, we still have all the soil amendments and seed starting mixes that you are familiar with, including Black Forest Compost, Bumper Crop, and Paydirt. March wouldn't be March without our Annual Pruning Clinic on March 12th. Perhaps you have come before - but come again for a refresher. Every type of pruning on every kind of tree and shrub will be covered. It's free and we will have the coffee on. Wear a jacket, because this clinic will be held outdoors with lots of demonstrations by David, Tom Henderson and his crew from Healthy Trees, and our own staff. Note that all of our Saturday classes are now starting at 10 AM. ATTEND A SEMINAR AND RECEIVE A 15% OFF COUPON FOR UP TO 5 PIECES OF REGULARLY PRICED MERCHANDISE. ALL SEMINARS COST $2. for a $25 gift certificate. Your lawn needs to breathe, just as we do . We frequently forget that plants, incorporate oxygen into their life cycles, just as we do. So, whether you're a novice gardener or an experienced one, remember this word: AERATION. Basically, it's poking a hole and removing a plug of soil/turf in your lawn so that soil that has become compacted is loosened, increasing its nooks and crannies that absorb water, air, and nutrients. Aeration also stimulates root growth, removes excess thatch, reduces water runoff, and increases the lawn's drought tolerance, all of which improve the overall health of the lawn. Soil compaction causes turf deterioration, and occurs in common situations, such as when we walk on our lawns, and even when we mow them. The first 2 to 3 inches of soil suffer the most. It is best to aerate in the spring and/or in the fall. David would rather have you aerate twice a year to remove excess thatch and forgo the use of a thatching machine, which can damage the crown of the grass plants. Top dress with PAYDIRT OR GYPSUM, or use FULL CIRCLE BOOST. You will need 1 1/2 yds. per 1000 square feet 1/2 " deep for adequate coverage. This will keep the holes open, which allows for better uptake into the lawn, preventing run off. This is also a great time to over seed your lawn. If using PAYDIRT OR FULL CIRCLE BOOST there will be enough nutrients in the products that additional fertilization is not necessary until germination and the first cutting has occurred. Additionally, PAYDIRT AND FULL CIRCLE BOOST contain thatch-eating microbes. Put the seed down before top dressing and then get good seed to soil contact afterwards by using a compost spreader to apply the top dressing. Now that we've discussed the "why" of aeration, Let's talk about the "how". Greenhouse Garden Center will gladly schedule aerating your lawn - but call for an appointment early at 882-8600 and ask for Robert. Mason bees are spring bees active late March through the first part of June. They are very active pollinators and arrive on the scene 3 to 4 weeks before honey bees make an appearance. Each mason bee can do the pollinating work of 120 honey bees. This is because they do not have a queen or hive to support. This is also probably the reason that these bees are not aggressive to humans, pets, or livestock. They are a solitary species (they do not congregate in hives). Each nest is the work of the solitary female, without the assistance of worker bees. Each female never lives to see her offspring. While female Mason bees are solitary, they are social - and nesting females attract other females if there are places for them to make nests by each other. If there are enough holes to go around you may be able to have many females localized and pollinating in your area. Mason bees belong to a group of bees that are cavity nesters. These type of bees have 3 things in common. They nest primarily in preexisting cavities. In nature, Mason bees will choose nesting sites such as hollow plant stems or beetle or woodpecker borings in dead wood. They will also nest in Mason bee habitats built specifically for that purpose. They collect substances such as mud, leaf parts, resin or tiny pebbles to line and seal cells. The tract of specialized pollen transporting hairs, the scopa, is situated on the underside of the abdomen. In early spring, the male Mason bees emerge first followed in 5-7 days by the female Mason bees. While the "guys" are waiting for the "girls" to show up they spend their time feeding on flower nectar and frantically hovering around the entrance to the nest. Male Mason bees will be quite aggressive with each other, jostling to be the bee closest to the nest entrance. For your sake, it is safe to note that they do not carry a stinger. Female Mason bees only mate once, so that is why the males are so aggressive with each other. The female Mason bee has the ability to store sperm in a special sac and that will be enough to fertilize her complement of 25-35 eggs. The male Mason bees will die off after 3 to 4 weeks. The female Mason bee will search out empty cavities suitable for nesting sites and begin the work of preparing them for her eggs. Initially, she will be feeding on only nectar. After the female Mason bee completes her first nest she will start on another one and may make a total of 4 to 5 nests. After a period of 6-8 weeks she dies. The female Mason bee is a very visual bee. Before she leaves the nest to forage for nectar she must memorize her location using the visual clues surrounding the nest. Once she has a mental map of her immediate and distant surroundings she is ready to forage. For this reason, when constructing Mason bee habitats nesting sites will be more attractive to the female if they are not perfectly symmetrical. After she has cleared out the cavity that will be her nest she will start to make mud from her saliva and soil and start to line her nest, beginning in the back of the nest. As she lays her eggs her foraging patterns begin to change. The female Mason bee will start to gather pollen in addition to the nectar to provision the individual cells where the eggs are laid. The females are larger and will require more pollen. Female eggs are laid in the nest first, while male eggs are laid closer to the entrance of the nest. About a week after she lays an egg, it will hatch into a tiny larvae, which will feed only on the egg fluids. After a second moult it will start feeding on the nectar-pollen stores. The larvae will moult 4 to 5 times before spinning a cocoons in July. Sometime in September, the Mason bee will have matured into an adult inside the cocoon. They will remain in their cocoons until the following spring, when they emerge and cycle begins again. Greenhouse Garden Center is very excited to feature the new bracelet line Chavez For Charity. This company was launched in early 2013, with a goal to create a line of fashion accessories that people would love to wear and at the same time be contributing, in a significant way, to charitable causes. For every bracelet sold, Chavez For Charity donate a percentage of profits to over 20 amazing causes. Every color tells a story and through the bracelet collection, conversations are facilitated that unite, inspire, and motivate people to take action. Greenhouse Garden Center is now a partner with this through our promotion of the Chavez For Charity 11 Project. For every white bracelet sold, 25% of profits will directly benefit CASA of Carson City. CASA is a National Court Appointed Special Advocate Association, together with its state and local member programs, support and promotes court-appointed volunteer advocacy so every abused or neglected child in the United States can be safe, have a permanent home and the opportunity to thrive. Beadworx by Grass Roots Creations, which is another giving back company. Job and skill creation at the grass roots level can feed entire families and take a step toward healing hardships in the world. The cornerstone of Grass Roots Creations has always been the economic uplift provided to their beading artists, framers and developers. Artist, Kristen Depante, has put together a unique collection of delightful, colorful creatures that are suitable for inside or out. Tillandsia, or air plants, are a unusual genus of plants that do not require soil to thrive. These types of plants are called epiphytes, because they use their roots to attach themselves to trees or rocks. They absorb moisture and nutrients through their leaves. Tillandsia is a genus of over 500 flowering plants in the Bromeliad family. Some of the blooms may be very fragrant. They are evergreen plants native to the forests, mountains, and deserts in Central and South America, the southern United States and West Indies. Airplants with appropriate care may last for a number of years. They require minimal care, generally spritzing 2-4 times per week and, if real dry, submersing in water 1-2 times a month for a couple of hours. Tillandsia like bright filtered light and good air circulation. They can tolerate temperature swings between 50-90 degrees easily. Avoid freezing temperatures. During, before, or even after bloom they will reproduce by throwing off pups which can be separated from the Mother plant as it dries up and dies off. They are ideally suited for small, glass globe terrariums and can be mounted on a variety of media including driftwood, picture frames, rocks, clay pottery, stones, or whatever your imagination can think of. Avoid treated wood, since it may contain copper which is toxic to the plants. Different glues are used to secure the tillandsia to the host object and may include Liquid Nails, hot glue, Goop, Tilly Tacker or E6000. Or they may simply be wired on. Dig organic materials into your vegetable and flower gardens for bigger crops and more efficient water use. Paydirt, Bumper Crop and Black Forest Compost are three blended organic mixes that are perfect for flower and vegetable beds. All of these organic mixes now contain mycorrhizae, a beneficial fungus which will make your plants more drought-tolerant. 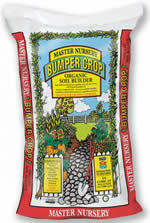 One bag of any of these organic mixes will be enough for 50 square feet. We had more moisture this winter but we aren't out of the drought yet - and all plant material will be more stressed starting into this growing season, making trees and shrubs more susceptible to damage caused by insects. Apply Bonide Tree and Shrub and Insect Control on deciduous trees as well as evergreens to prevent borers, aphids and elm leaf beetles. This is a once-a-year soil drench application that eliminates the use of repeat sprayings with insecticides throughout the growing season. Apply Bayer Fruit, Citrus & Vegetable insect Control to fruit trees and vegetable gardens for annual insect control. Greenhouse Garden Center has received better pricing this year and is happy to pass that savings on to our valued customers. New this year is the Ferti-Lome Tree and Shrub Systemic Soil Drench available in a 2.5 gallon container. Reserve Mason Bees now. They are early pollinators, which start pollinating long before honeybees come out of hibernation. A limited supply will be arriving mid-March. It is time to fertilize your lawn. Dr. Earth Lawn Food is 100% organic and contains beneficial mycorrhizae and microbes. There is still time to spray dormant oil and lime sulfur fungicide on fruit trees and roses to suffocate over-wintering insects and control disease. Apply Casoron early in the month, if you haven't done so yet. Casoron does not control weeds that are already up. Start planting cool-season crops in the garden. Carrots, peas, onions, cabbage and lettuce are some early-season favorites. For a complete list of cool-season crops, come into Greenhouse Garden Center and we will be happy to give you that hand-out. Spray Florel once a week for 3 weeks on the greenish flowers on elms and cottonwood and the red flowers on silver maples. NO SEEDS, NO COTTON AND NO BOXELDER BUGS! New garden stock is arriving every week. It's time to start to think about landscaping! Remove 80% of the salt water from the pond for healthy fish and plants. Add fresh water slowly over a 2 week period. In a bowl, combine all ingredients except bread. Chill covered for at least 2 hours. Spread mixture on bread, add a slice on top, and enjoy a delicious twist on a tuna salad favorite. Notes: To make a tuna melt, add one slice of cheese and a tomato slice to the sandwich, and grill three minutes on each side on med-high heat in a well buttered skillet! Can also be made with salmon instead of tuna.